The best sale of the year is here! Happy Nordstrom Anniversary Sale, friends! I'm sure you've seen a dozen posts on the #NSale, but come on, the deals are just too good this year! I'm talking Stuart Weitzman boots for under $500, pretty lacy Free People bralettes as far as the eye can see, and enough discounted denim to make a Levi's factory envious. Plus, unlike other sales, these items are brand new, and they aren't just the funky leftovers that inhabit most sale racks. These are fashionable, timeless autumn pieces that will keep you looking chic well into 2017. So, what's on The Fashion Barbie's Anniversary Sale wish list? I'm looking for stylish staples that will elevate my look from college girl to career woman. A classic camel coat from DvF will go with absolutely everything, and I'm adoring the feminine-chic look of this Frame bowtie blouse (paired with their also on-sale straight-leg jeans, of course). 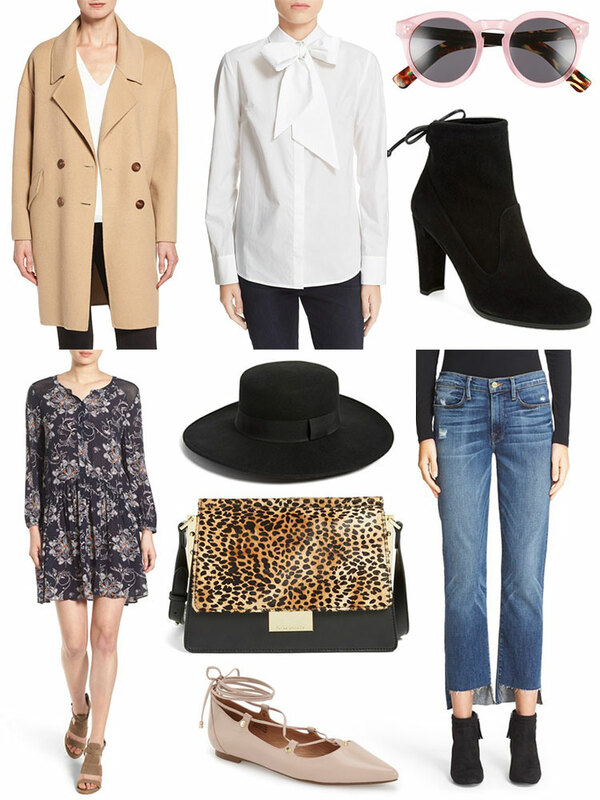 Vince Camuto has the work-appropriate leopard print purse of my dreams, and I've been lusting over the perfect cool girl hat for a while now; at $29, this Hinge topper will do the trick quite nicely. See the rest of my Anniversary Sale favorites below! If you're a Nordstrom Rewards member, get to shopping! If not, the Anniversary Sale begins on July 22nd and ends August 7th. What are you hoping to score at the Anniversary Sale?